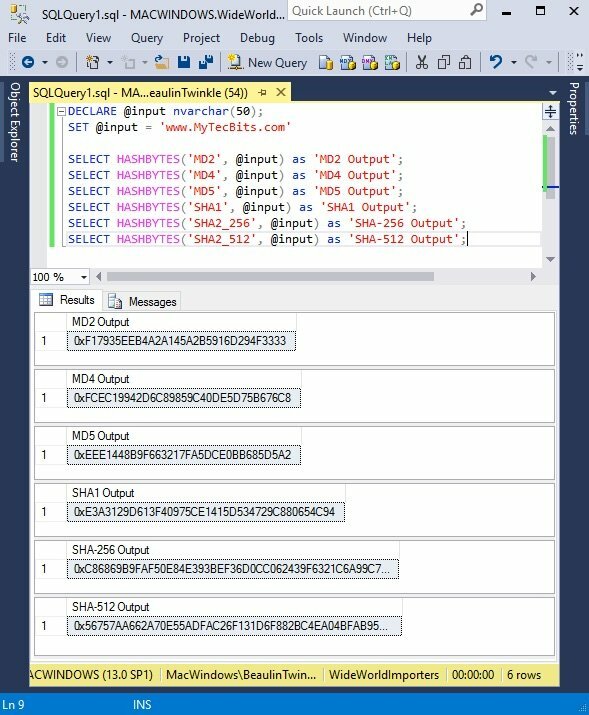 In SQL Server, for simple hash code encryption like password encryption, we can use the HASHBYTES function to encrypt the string. This is a built-in cryptographic function with hashing algorithms like MD-2, MD-4, MD-5, SHA-1, SHA-2 (256 and 512). In these algorithm, SHA-2 (256 and 512) are introduced in SQL Server 2008. The other MD and SHA1 algorithms are available in SQL Server 2005 onwards. Starting from the current version (SQL Server 2016) only SHA-2 (256 and 512) are recommended. All the earlier versions of MD and SHA-1 are depreciated. HASHBYTES function takes in hashing algorithm type and a string to be hashed and returns the generated hash code. Let’s see how to use the HASHBYTES function and generate the hash code of various algorithms. To store a password in hash code, make sure the column which you want to store the hash code is of data type varbinary. Then. 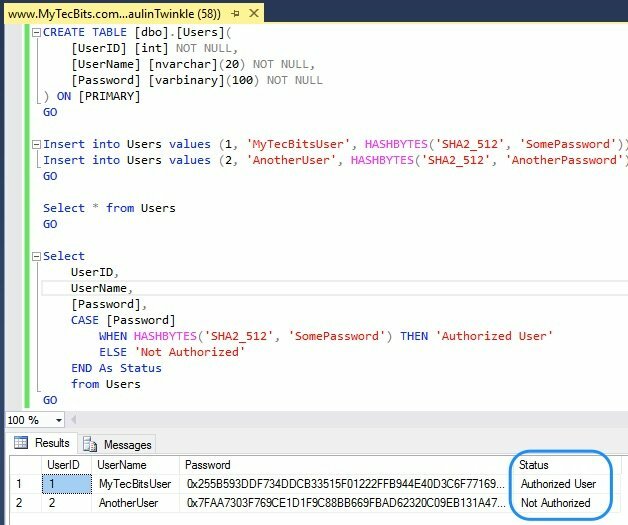 use the HASHBYTES function in the insert statement to generate the hash for the password and store it in the column. Below is an example to store a password in hash code with SHA2 512 algorithm and comparing the hash coded password in a select statement. Cryptographs hash code generators in tools section. Details about HASHBYTES built-in cryptographic function in MSDN.